Inflatable arches elicit some of the strongest opinions, both pro and con, of all the major elements of event infrastructure. They’re easy to use (flip a switch and stand back) and relatively low cost, but are they too informal? They can be difficult to use in windy conditions, but are far more versatile on uneven terrain than hard truss structures. As is so often the case, a lot of the value of an inflatable arch is built into the initial investment. You can buy cheap, and be frustrated and disappointed, or spend more, and own a piece of equipment that will be serviceable for many years. And because we’re in the event business, there’s a little more involved than simple ROI. 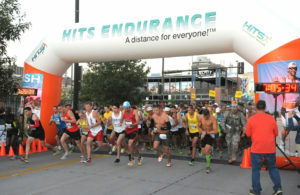 Price will quickly become the least of your worries when the equipment breaks on Saturday morning and you are left with nothing but a sad, inexpensive puddle of deflated vinyl at your starting line. The risk of critical failure at the worst possible time should to be factored into almost any buying decision in the event business, and that is especially true when it comes to inflatables. You see where I’m going with this. In my business here at MPA Event Graphics, I’ve tried sourcing and selling inexpensive arches. It wasn’t a failure, it was a disaster. Having used inflatables of one kind or another for the past 40 years, here’s some of what I’ve learned. Many of the imported inflatable arches currently being sold directly or resold by U.S.-based distributors are poly fabric coated vinyl — basically a lightweight vinyl bladder covered with a digitally printed fabric skin. The main advantages here are low cost and the digital printing – which can look pretty fancy right out of the box. Unfortunately, once your arch is printed, that’s pretty much it. You can’t retrofit the fabric skin with Velcro or self-adhesive graphics to hide or change what’s already there. If the balloon is punctured, the surface will not accept the universal quick fix in that department: duct tape. And typically, these types of inflatables are not built to last. The fabric skin, which is dye sublimated, is subject to weathering, fading and delamination. Other than that, what’s not to love? I would strongly recommend against purchasing a fabric-covered arch. The vinyl used for inflatables looks and feels like standard vinyl banner material, but with a bit of stretch to it. The lighter the vinyl, the lighter the arch, but you may sacrifice some durability with a lightweight arch – particularly in the seams. The best arches are well-sewn, with tight, double-stitched interior seams that will not stretch appreciably over time. It’s pretty simple; if seams stretch, you’ll start losing air and it will hard to keep your arch properly inflated. Poorly-sewn seams are the first indication that you’ve saved too much money on your arch. Most inflatable arches made in the U.S. are manufactured from 7-8-oz reinforced vinyl. Fire retardancy seems to be a hit-or-miss proposition, and it shouldn’t be. You never know when you’ll run into a fire marshal with a chip on his or her shoulder. At MPA we use 18-oz FR vinyl for our standard size arches (15’W x 11’H w/36” tubes). They are rugged and are built to last for many years. And having a fire cert in your back pocket on race morning is never a bad thing. A right-angle arch on the beach at the Major League Triathlon Series. Matching tent and fencing make for a sharp-looking site. Of the three options, the simple 90-degree or doorway arch requires the least fabrication and is thus the least expensive. We tend to use this shape for smaller arches with 12-foot interior spans or less. For larger arches (12-15’ interior width or more), angled corners are preferred because the top tube is less likely to droop or sag. If you prefer the look, continuously curved arches are widely available and tend to be used for larger footprints. One issue is that it’s difficult to make replaceable signage fit well or look good on a curved arch, so you’re probably making more of long-term graphic commitment with this shape. You can choose to print or paint permanent signage onto your arch, or you can add Velcro, D-rings or webbed loops to accommodate replaceable signage in the form of banners. I’ve found that solid vinyl or mesh vinyl banners work equally well, although you may have less problems with wrinkles and creases if you use mesh. You’ll get the most use out of your arch with all-replaceable signage, using sewn Velcro on the balloon to accommodate matching Velcro sewn onto the back of vinyl banners. This allows you to switch branding and messaging on either or both sides of the top and vertical tubes. (For instance, START on one side and FINISH on the other.) Sponsor-change-outs, logo revisions, even different events can all be accommodated easily, quickly and at minimal expense. A large (24’) angled-corner arch, with printed top tube. If, on the other hand, you know for sure that the arch has one purpose and one purpose only, by all means go ahead and paint or print. We have a lot of clients with permanent signage on the top tube and interchangeable signage on the verticals. HINT: If you want your banners to look sharp and wrinkle-free, attach them prior to inflation. This takes a bit more time, but the finished look is well worth the trouble. Your arch should have one long zippered seam at the bottom (usually outside) of each vertical tube to help speed the release of air when the arch is deflated. The zipper is covered by a Velcro flap both to protect and disguise the zipper. This is where most inexpensive balloons fail first. Zippers should feature UV-resistant marine-grade chains of the very highest quality, double-stitched securely into the opening. Sliders should grip the teeth securely. The finish of the flap is often an indication of the quality of the balloon generally. The devil is in the details. D-Rings and webbed loops are sewn into the seams to attach tie-down ropes and accessories like banners. All fittings should be surely reinforced and double-stitched. Pull hard on a D-ring. It should be secure, with no movement at the stitches or along the seam where it’s placed. Inflatable arches are “forced-air inflatables.” They are not air-tight and require a continuous flow of air from a secondary blower unit. You can run your blower unit directly from a nearby power source, or from portable gas generator. If the plug is pulled, or the generator fails, the arch comes down – which is one of the reasons some folks don’t like inflatables: there’s no margin for error. The collapse is graceful but immediate. Properly powered, your arch should be fully shaped (more on that below) and firm to the touch. If it’s mushy-feeling, you either need a more powerful blower or your balloon is old and the seams are leaking. Interestingly, leaky seams can be caused by using a too-powerful blower. You want just enough air to make the arch look good, but not so much that the legs start to look like over-stuffed sausages. Filler tube (it really should be straight) with .5HP B-Air blower (left) and an internal fan detail (right). Internal fans offer a cleaner look, but there is no recourse on site if the unit malfunctions. For a standard 15’ x 11’ arch we use a B-Air ½ HP Koala KP-680. B-Air blowers are sold widely in the U.S, including on Amazon, and are the most reliable blowers in the business. If your imported blower fails, it’s not worth saving. Buy a new B-Air on line. Most forced air inflatables feature an external filler tube with a Velcro collar that wraps around the output nozzle of the blower unit. However, you may see nice-looking arches with blower units built into one of the legs. Slick. Clean. Elegant. Tempting. But ask yourself this: What happens when that blower fails on race morning? I’ll take an external blower any time. If it fails, and you don’t have a spare handy (it’s always a good idea to have a spare in the trailer, honestly), you can always head to Home Depot or Lowes and buy an inexpensive electric leaf blower. Remove (or simply don’t install) the long nozzle, then hook that baby right up the arch filler tube and flip the switch. Voila! Balloon! No matter what shape or size arch you use, it needs to be firmly secured to existing infrastructure. Trees work. So do light poles, fencing, perhaps even a parked truck. (As long as it belongs to the race.) If you have nothing suitable, 55-gallon drums filled with water or sandbags are best, or use a largish stack of cinder blocks. You’ll find that sandbags on their own are easily dragged along the ground if it gets windy and the arch starts to move. It’s also important to assign a member of your crew, or a reliable volunteer or two, to oversee the arch, watching for wind or changing conditions that may require adjustments, and to check that the generator has gas and/or the power source is secure. 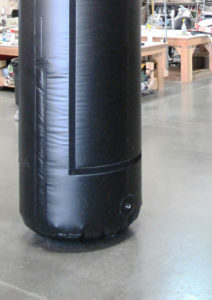 Since forced air inflatables are not air tight, small rips and tears can be patched temporarily with duct tape. 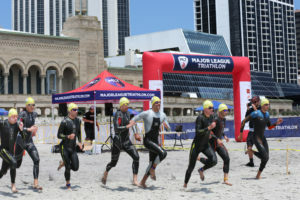 In terms of where on a race site arches work best, they are great on uneven terrain — swim start/swim finish lines in a triathlon, for instance) — and wherever a quick, short-term, up-and-down overhead solution is required. For smaller races with smaller budgets, inflatable arches at the finish line are perfectly acceptable and can look terrific. For larger races with larger fields, more sophisticated truss structures are usually more appropriate. For more information about MPA arches, here’s a link: https://mpagraphics.com/product/inflatable-arch/. Or shoot us an email: sales@mpagraphics.com. Note: This article was originally published on racedirectorshq.com. PreviousPrevious post:The Difference a Voice Can Make – Why a Professional Announcer is Important to Your EventNextNext post:Partner Up!